Fried food can cure a number of ailments, including extreme hunger, PMS and hangovers. But we all know by now that consuming fried food can lead to serious health issues like heart disease and Type 2 diabetes. And eating fried food in restaurants can quickly stretch your budget. Surely there’s a way to enjoy your favorite fried foods without causing long-term damage to your health and your wallet, right? A few years ago, I ditched fried food and meat for good, which helped me lose about 25 pounds. In addition to losing weight, I just felt better not eating fried food. However, that doesn’t mean I don’t get cravings for french fries and fresh falafel. But when I do, I have a number of copycat recipes to satisfy my cravings without ruining my diet (and my mood). The following are some of my favorite vegetarian unfried recipes that are easy to make and just as tasty as their fried counterparts. There’s nothing I crave more after a hard workout or a long day at work than a salty, crispy french fry. Instead of hitting the drive-thru for my fix, I turn to this recipe from Cookie and Kate, which produces surprisingly crispy fries for an oven-baked recipe. The secret to getting that crispy exterior and fluffy interior I love is to soak the potatoes to remove some of the starch before baking. The recipe is a little time-consuming but totally worth it. Falafel is one of my favorite foods, but most recipes call for you to fry the patties in oil to make them crispy. However, I’ve successfully made falafel in the oven multiple times using recipes like this one from Minimalist Baker. These baked falafel burgers taste just as good — if not better — than traditional fried ones. Serve them in warm pitas with toppings like sliced tomatoes, red onion and tzatziki sauce. Full disclosure: I am not a fan of zucchini. But like anyone who has tried growing vegetables, has family who grows vegetables or knows someone who has family who grows vegetables, I have been inundated with zucchini of all shapes and sizes over the years. My advice? Bread and bake those suckers using this vegetarian recipe from Chocolate Covered Katie. Even though I am not a zucchini person, I’ve happily gobbled up more than my fair share of these. I like them served with marinara sauce, but I bet plain old ketchup would make a fabulous dipping sauce. This recipe from Minimalist Baker is a little more unique, but it’s honestly one of the best things I’ve made in years and has made regular appearances on my dinner table. Even if you’ve never tried fried avocados before, you’ll still appreciate this unfried version. The avocados are warm, creamy and have a slight crunch from the panko breadcrumbs. 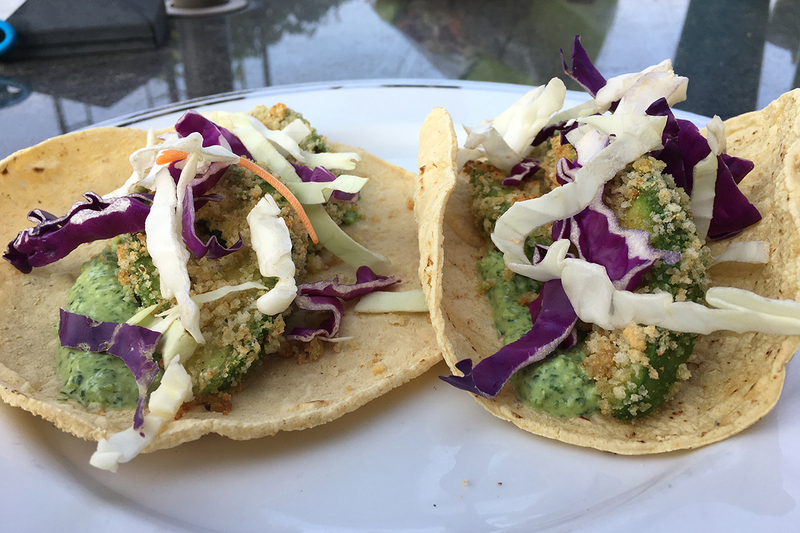 Pair these with shredded cabbage and chopped green onions in a warm corn tortilla, and top them with creamy cilantro dressing. You won’t regret it. While I believe that almost anything is okay in moderation when it comes to food, I still stay away from fried foods just because they make me feel sluggish. But thanks to these vegetarian ‘unfried’ recipes, I can still enjoy the foods I like without worrying that I’ll feel greasy and bloated afterwards. Catherine Hiles loves making new recipes, though she unashamedly eats oatmeal for breakfast every morning. Her current obsession is avocado toast with fried eggs and Trader Joe’s ‘Everything But the Bagel’ seasoning.